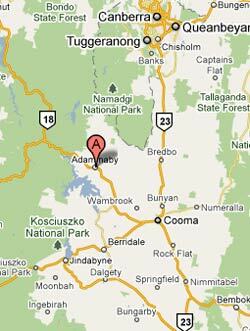 The historic town of Adaminaby is midway between Cooma and Mount Selwyn, only a 10 minute drive from Lake Eucumbene, a premier trout fishing lake. It is one of the highest towns in Australia, and snowfalls are not uncommon even during summer. European graziers arrived in the 1830s but there was little development in the area until the 1850s when gold was discovered at Kiandra. In 1885 the town was proclaimed and was first named Seymour. A year later, by popular acclaim, it was changed back to Adaminaby, the name it had been known by since early settlement. Until 1901, the upper Eucumbene River was known as the Snowy. Local historians believe that Banjo Patterson’s most famous poem, “The Man From Snowy River”, may have been inspired by the exploits of an Adaminaby stockman, Charlie McKeahnie. McKeahnie died a young man in a riding accident in 1895 and is now buried in the Old Adaminaby Cemetery on the shores of Lake Eucumbene. Patterson’s character,the Man From Snowy River, is most likely a composite character, based on various people involved in brumby hunts such as were conducted in the Adaminaby district. The ill fated poet Barcroft Boake (who found most of his inspiration in Adaminaby) also wrote about McKeahnie’s ride in “On the Range”. McKeahnie chases a horse which had escaped with a mob of brumbies. This true event is acknowledged to have occurred between Nungar, south of Tantangra and Yaouk when McKeahnie was about 17. In this account, however the horse he is after is killed in the chase. Nobel Prize winning author Patrick White worked as a jackaroo at Adaminaby’s Bolaro Station in the 1930s. The Snowy Mountains region was an important gathering point for the Aborigines of the Adaminaby and surrounding districts for many thousands of years. Inter-tribal summer meetings being held in the High Country involving up to a thousand people for feasting on the Bogong Moth. Interestingly, the first settlers followed very much the same patterns of seasonal movement with their flocks as the Aborigines up until the 1950’s. Adaminaby is a popular destination for horse riders, bushwalkers, fly-fishermen and water sports enthusiasts as well as a great base for viewing the Snowy Mountains Scheme. It is of course also the service and accommodation centre for the Mount Selwyn ski field. Selwyn traces its origins to the ski-fields at nearby Kiandra. Recreational skiing in Australia began around 1861 at Kiandra, New South Wales, when Norwegian gold miners introduced the idea to the frozen hills around the town. The Kiandra snow shoe club (now called the Kiandra Pioneer Ski Club (1861)) remains the world’s first identifiable and ceaseless Ski Club. The facilities at Kiandra were moved to the more reliable snow at Selwyn in 1966. Selwyn is the most Northerly of Australia’s ski resorts with a base elevation of 1492 m and a top elevation of 1614 m. Today it boasts 35 of it’s 46 hectares of downhill runs are serviced by snowmakers. Selwyn’s runs carry the names from the old Kiandra goldfields.